Brother ***** I now present you with a leather vest; It neither is a cut nor is it called colours. It is an emblem and a badge of a Widows Son. It is always to be worn with equal pleasure to yourself and honour to this fraternity. On the back, you will see the working tools of Masonry. The Square, trowel, level, and the All Seeing Eye. The Square: is a symbol of morality. This is its general signification, and is applied in various ways: It presents itself as one of the Three Great Lights. It is a reminder to always square our actions. The Level: The level is that on which there are no in-equalities, hence in Masonry it is correctly used’ as a symbol of equality. “We meet upon the level” because Masonic rights, duties, and privileges are the same for all members without distinction. The All seeing Eye: the open eye was selected as the symbol of watchfulness, and the eye of God as the symbol of Divine watchfulness and care of the universe. The words: Meet on the level & part upon the Square: Is a reminder to always be on the level with your brothers and squaring your actions and departing as friends and with brotherly love. In Ancient Craft Masonry, the title applied to Hiram, the architect of the Temple, because he is said, in the first Book of Kings (vu, 14) to have been "a widow's son of the tribe of Naphtali." The Adonhiramite Freemasons have a tradition which Chapron gives in the following words: "The Freemasons call themselves the widow's sons, because, after the death of our respectable Master, the Freemasons took care of his mother, whose children they called themselves, because Adonhiram had always considered them as his Brethren 'As the wife of Hiram remained a widow after her husband was murdered, the Freemasons, who regard themselves as the descendants of Hiram, called themselves Sons of the Widow." which makes Hiram himself the widow's son. Now Brother *********. You have divested your time and earned the right into the Widows Sons. 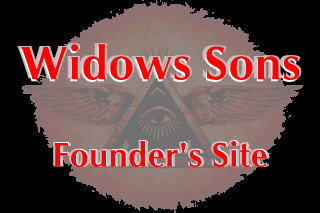 There is no other group of Freemasons with the eyes of the public on them more than the Widows Sons. By becoming a Branded Brother of our Order, you will find a much greater opportunity to enlarge your circle of Masonic friends beyond the scope of your home in the Blue Lodge. Know that, while riding with the Widows Sons, you will be among Brothers who are both dedicated to the great moral precepts of our Mystic Fraternity and who enjoy the blessings of the G.A.O.T.U. from the saddle of a motorcycle.